The Third Generation Partnership Project's Long Term Evolution-Advanced is considering relaying for cost-effective throughput enhancement and coverage extension. While analog repeaters have been used to enhance coverage in commercial cellular networks, the use of more sophisticated fixed relays is relatively new. The main challenge faced by relay deployments in cellular systems is overcoming the extra interference added by the presence of relays. Most prior work on relaying does not consider interference, however. This paper analyzes the performance of several emerging half-duplex relay strategies in interference-limited cellular systems: one-way, two-way, and shared relays. The performance of each strategy as a function of location, sectoring, and frequency reuse are compared with localized base station coordination. One-way relaying is shown to provide modest gains over single-hop cellular networks in some regimes. 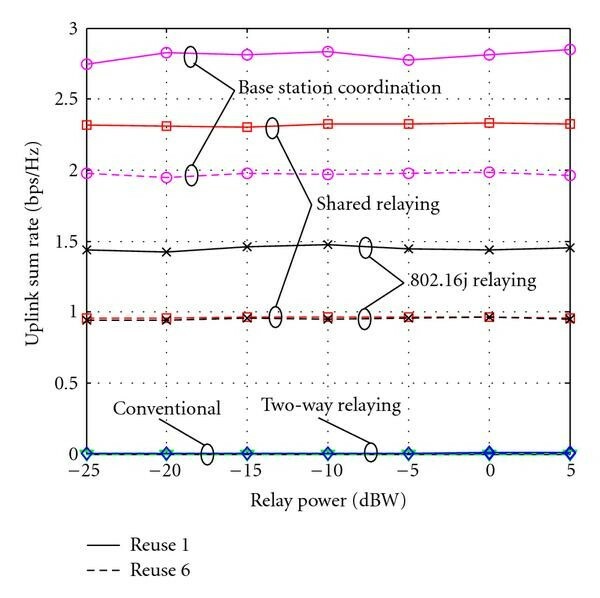 Shared relaying is shown to approach the gains of local base station coordination at reduced complexity, while two-way relaying further reduces complexity but only works well when the relay is close to the handset. Frequency reuse of one, where each sector uses the same spectrum, is shown to have the highest network throughput. Simulations with realistic channel models provide performance comparisons that reveal the importance of interference mitigation in multihop cellular networks. The Third Generation Partnership Program's Long-Term Evolution Advanced (3GPP-LTE-Advanced) group is developing a new standard for mobile broadband access that will meet the throughput and coverage requirements of a fourth generation cellular technology . One of the main challenges faced by the developing standard is providing high throughput at the cell edge. Technologies like multiple input multiple output (MIMO), orthogonal frequency division multiplexing (OFDM), and advanced error control codes enhance per-link throughput but do not inherently mitigate the effects of interference. Cell edge performance is becoming more important as cellular systems employ higher bandwidths with the same amount of transmit power and use higher carrier frequencies with infrastructure designed for lower carrier frequencies . One solution to improve coverage is the use of fixed relays, pieces of infrastructure without a wired backhaul connection, that relay messages between the base station (BS) and mobile stations (MSs) through multihop communication [3–11]. Many different relay transmission techniques have been developed over the past ten years. The simplest strategy (already deployed in commercial systems) is the analog repeater, which uses a combination of directional antennas and a power amplifier to repeat the transmit signal . More advanced strategies use signal processing of the received signal. Amplify-and-forward relays apply linear transformation to the received signal [13–15] while decode-and-forward relays decode the signal then re-encode for transmission . Other hybrid types of transmission are possible including the information-theoretic compress-and-forward  and the more practical demodulate-and-forward . In research, relays are often assumed to be half-duplex (they can either send or receive but not at the same time) or full-duplex (can send and receive at the same time) . While full-duplex relays are under investigation, practical systems are considering half-duplex relay operation, which incur a rate penalty since they require two (or more timeslots) to relay a message. Two-way relays avoid the half-duplex assumption by using a form of analog network coding that allows two messages to be sent and received in two time-slots . Relaying has been combined with multiple antennas in the MIMO relay channel [21, 22], and the multiuser MIMO relay . Despite extensive work on relaying, prior work has not as extensively investigated the impact of interference as seen in cellular systems. One exception is , which utilizes resource allocation to avoid interference. 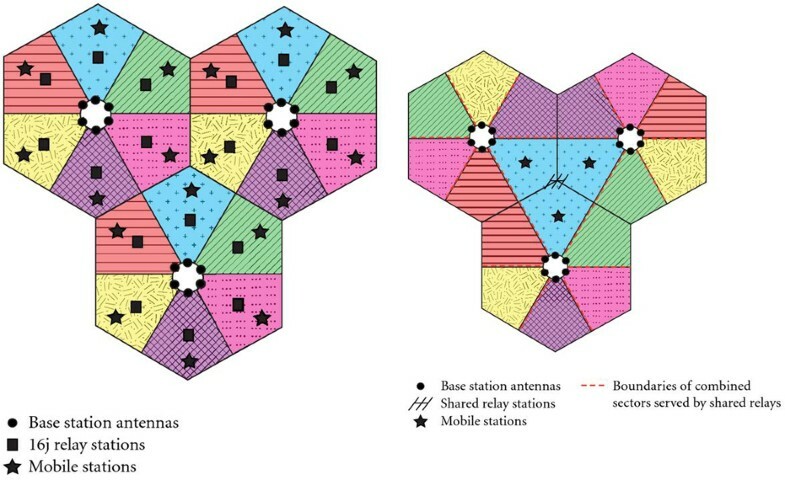 Conversely, this paper considers exploiting the interference using increased spatial dimensions via extra antennas at the relay. The first commercial wireless network to incorporate multihop communication was IEEE 802.16j . Its architecture constrained the relays for being served by a single base station and allowed them to communicate in only one direction at a time (i.e., either uplink or downlink). From a design perspective, unfortunately, IEEE 802.16j had several restrictions that drastically limited its capability, for example, the transparent mode that supports relaying-ignorant mobile subscribers. Further, the relays were not designed to specifically mitigate interference. Consequently, LTE-advanced may consider more sophisticated relay strategies and thus may expect larger performance gains from the inclusion of relaying. Investigation into the possible relaying architecture for LTE-Advanced has begun. The coverage and throughput gains for an OFDMA network have been numerically analyzed using both idealized terrain  and ray tracing software applied to particular urban areas [27, 28]. 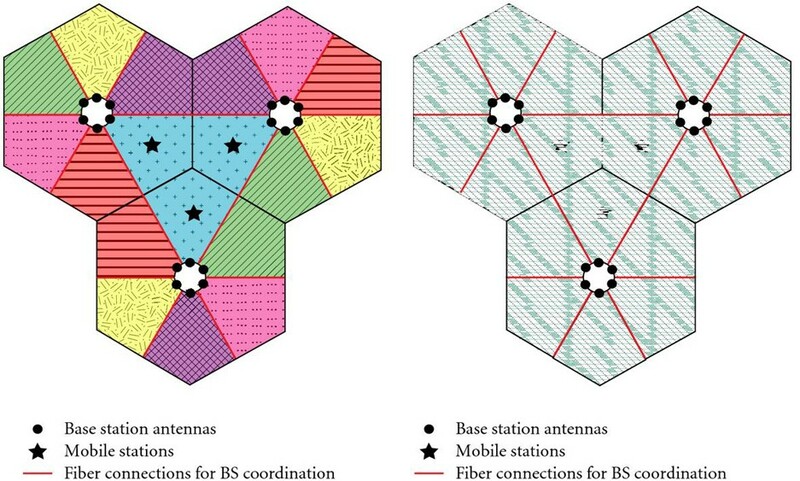 The types of relaying strategies considered in these papers were relatively simple, considering only one-way single-antenna decode-and-forward relaying. The general conclusion is that multihop relaying is a cost-efficient solution to achieving the systemwide goals of next generation OFDMA networks. In this paper, we evaluate the benefits of several promising relaying strategies for 3GPP-LTE-Advanced. We consider three specific strategies including one-way relays, two-way relays, and shared relays. The one-way relay possesses only a single antenna and is deployed once in every sector. It performs a decode-and-forward operation and must aid the uplink and downlink using orthogonal resources. The shared relay concept was recently proposed in IEEE 802.16m  but is readily applicable to GPP. The idea is to place a multiple antenna relay at the intersection of two or more cells. The relay decodes the signals from the intersecting base stations using the multiple receive antennas to cancel interference and retransmits to multiple users using MIMO broadcast methods. The two-way relay, also called analog network coding  and bidirectional relaying , is a way of avoiding the half-duplex loss of one-way relays . The key idea with the two-way relay is that both the base station and mobile station transmit to the relay at the same time in the first time slot. Then, in the second time slot, the relay rebroadcasts what it received to the base station and mobile station. Using channel state information and knowledge of their own messages, the base and mobile stations are able to decode information sent from the other party. To study the performance of each relaying strategy we derive expressions for their achievable rate assuming Gaussian signaling. The rate expressions illustrate how other-sector and other-cell interferences impact performance and allow for efficient network simulation. For example, the analysis shows that two-way relaying has the potential for severe interference enhancement since (i) there are more sources of interference and (ii) it performs an amplify and forward that rebroadcasts the received interference. Shared relaying seems to offer the most resilience to interference since it exploits the MIMO MAC (multiple access) channel to decode three signals cochannel and the MIMO broadcast channel to deliver three interference-free signals. The direct path is neglected in each of the relaying scenarios as the area under consideration is mainly the cell edge. To compare the performance of different relay strategies, we compare their performance using a system simulator. Channel models from the IEEE 802.16j specification  are used since they include models for fixed relays. The simulator places users in fixed locations in each sector and computes the sum rates derived in this paper assuming that the channel is fixed over the length of the packet. These rates are reasonable in that they are nearly achievable in real slow-fading systems with powerful coding and aggressive adaptive modulation. Comparing the performance of different relaying strategies in a single set of simulations provides extensive comparability that is not possible when comparing different references. As a baseline for performance comparison we compare with several different cellular configurations including sectoring and frequency reuse. To be fair, we also compare with an emerging transmission technique known as base station coordination [34–37]. The idea is that by coordinating the transmission of multiple base stations, sharing data and channel state information, it is possible to eliminate interference by effectively having the multiple base stations act as one single transceiver. Several suboptimal strategies have been proposed to realize base station coordination such as coordinated resource allocation  or clustered coordination . Such strategies have made base station coordination a viable technology for GPP that may be complementary to relaying or a more complex alternative. The main conclusions of this paper are as follows. The one-way relay enhances capacity near the cell edge but is very limited by interference. The shared relay is able to remove much of the dominant interference and provides much of the gain of localized base station coordination, which gives the highest rates of the strategies compared in this paper. The two-way relay struggles to get any rate to the mobile-to-base station link unless the relay is very close to the mobile station because of interference from adjacent base stations. Further research into this area is warranted, however, by the success of the two-way relay in the downlink combined with its simplicity. In all cases, frequency reuse 1 (where each sector and each cell use the same spectrum) outperformed frequency reuse 6 (where the spectrum is divided into six bands, one for each sector). The rest of this paper is organized as follows. Section 2 introduces the general cellular model considered in this paper. Section 3 discusses the one-way architecture as a baseline of comparison for the rest of the paper. Section 4 considers two-way relaying and derives the sum rate over a number of different CSI assumptions. Section 5 presents a transmission strategy for shared relaying and derives the sum rate. Section 6 discusses base station coordination over a limited area. Section 7 compares all of the presented strategies under different frequency reuse plans. Section 8 gives a discussion of the results from the previous section while Section 9 summarizes the main results in the paper and provides directions for future work. This paper uses the following notation. The refers to . Bold uppercase letters, such as , denote matrices, bold lowercase letters, such as , denote column vectors, and normal letters denote scalars. The notation denotes the Hermitian transpose of matrix . The letter denotes expectation, denotes the minimum of and , is the magnitude of the complex number , and is the Euclidean norm of vector . 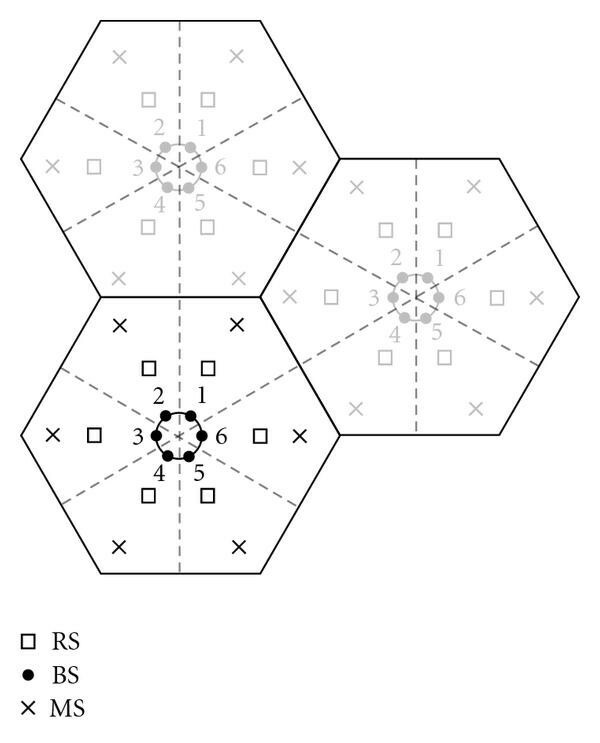 In the analysis we consider an arbitrary hexagonal cellular network with at least three cells as shown in Figure 1; the simulations will include an extra tier of cells, providing two tiers of total interference (see Section 7 for details). The base stations are located in the center of each cell and consist of six directional antennas, each serving a different sector of the cell. The antenna patterns are those specified in the IEEE 802.16j channel models . The channel is assumed static over the length of the packet, and perfect transmit CSI is assumed in each case to allow for comparison of capacity expressions. Thus, each cell has sectors. The multiple access strategy in each sector is orthogonal such that each antenna is serving one user in any given time/frequency resource. We assume that the channels are narrowband in each time/frequency resource, constant over the length of a packet, and independent for each packet. This is known as the block fading model. These assumptions correspond to one ideal LTE OFDM subchannel and, although unrealistic in practice, are useful for deriving capacity equations that can be used for deciding the actual data rate and for simulations deriving an upper bound on throughput. System model with 3 cells, each with 6 sectors. The analysis makes no assumption on the number of cells, and the frequency reuse pattern varies for the different architectures under consideration. 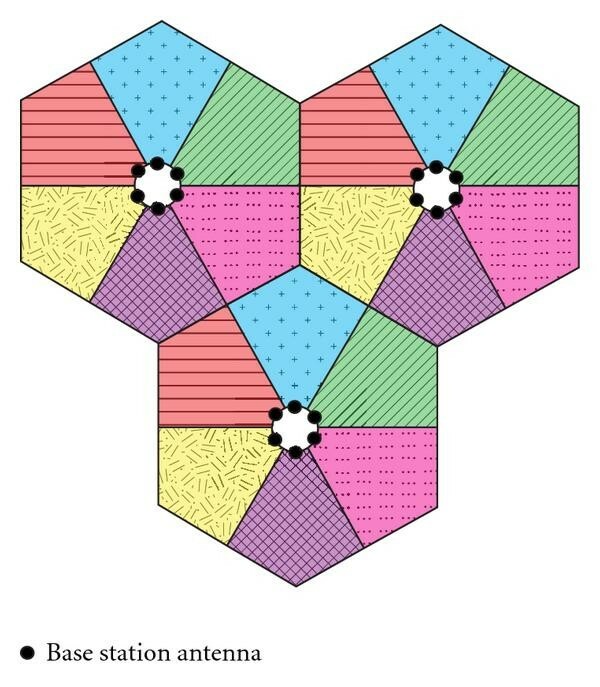 This paper focuses on the triangular region in the center of the model. Most of the analysis in this paper will focus on downlink communication, but a similar analysis can be applied to the uplink in each case. In the one-way and shared relay cases, communication takes place in two orthogonal phases. In the first phase, the base station transmits while the relay receives (the mobile may or may not receive), and in the second phase the relay transmits while the mobile receives. There will be a capacity penalty due to the use of two phases to transmit the same information. We assume that the phases are synchronized so that the first phase and second phase occur simultaneously in all cells. In the two-way case, the base station and mobile stations both transmit in the first phase, while the relay transmits in the second phase, as will be explained in Section 4. We consider different rates of frequency reuse. For a reuse of , the spectrum is divided into orthogonal bands where each one will be used in a regular pattern times over an area covering cells. We refer to this as reuse. In this paper we will consider only reuse and reuse, and thus for simplicity we will henceforth drop the from the notation and refer to only reuse . In this case, mutual information will be scaled by to make fair comparisons. Different patterns of frequency reuse are used in different scenarios as shown in Figure 2. For shared relaying and base station coordination, the interfering sectors share the same frequency. For the one-way relay and the two-way relay, the interfering sectors use different frequencies. The analysis assumes that one user per sector has been arbitrarily scheduled, meaning that the exact scheduler is not considered since we are not analyzing multiuser diversity. The system details of each specific architecture are explained in their respective sections. Specifically, we compare each transmission model with frequency reuse factors of 1 and 6. The one-way model consists of one single-antenna relay per sector serving only users in its sector. The shared relay is shared among three sectors in three adjacent cells (e.g., the sectors making up the center triangle in Figure 1), allowing it to serve users in each of those sectors. The two-way model consists of a single amplify-and-forward relay per sector and allows simultaneous uplink/downlink communication, removing the half-duplex loss of conventional relaying. Base station coordination assumes a lossless, zero-delay fiber link between adjacent sectors (the same ones serving the shared relay) and allows the base stations to cooperatively transmit in the downlink and receive in the uplink as if they were one large multiple-antenna transceiver. Each of these models is discussed in the remainder of this paper. Each hop of communication is assumed to use ideal coding and adaptive modulation so that mutual information may be used. This does not, however, guarantee that the end-to-end capacity is reached as the relays are performing a strictly suboptimal strategy (decode-and-forward for the shared and one-way relays, amplify-and-forward for the two-way relay). Other-sector and other-cell interference is assumed Gaussian and treated as noise unless specifically treated as in the shared relay case. All RF receive chains are assumed to have identical noise variance . In this section we introduce the one-way transmission model, which resembles IEEE 802.16j relaying. As with IEEE 802.16j, each relay has a single "parent" base station, creating a tree architecture. The relay, which decodes its receives signal, is thus a part of the cell its parent BS serves. Further, the uplink and downlink are divided orthogonally in time or frequency, depending on the duplexing method. Finally, the mobile station is unable to exploit the direct link. To simplify the analysis and ensure for fair comparison, we allow one single-antenna decode-and-forward relay per sector. Assuming that all base stations transmit at the same time, frequency, and power, and that the cellular architecture is such that each cell sees the same interference (i.e., neglecting network edge effects), we can focus on a single sector of a single cell and avoid overuse of subscripts. As mentioned in Section 2, we assume an i.i.d. block fading model and can thus focus on the transmission of a single block of packets over which the channel is static. We also remove time indices of the symbols for ease of notation. where is the BS-RS channel (transmit power is absorbed into ), is the symbol transmitted by the BS (normalized so that ), is the vector of channels between the relay and all interfering base stations (including intercell and intersector), is the vector of transmitted symbols from all the interferers, and is the additive white Gaussian noise observed at the relay with variance . The subscript refers to interference, refers to noise, and the subscript denotes that the reception is at the relay. Here, is the RS-MS channel (with absorbed transmit power as in the first hop), is the vector of channels between the mobile and all interfering relays, and is the vector of transmitted symbols from all the interferers in the second phase of transmission. As in the first hop, the interference is assumed to be Gaussian and has variance . Here, the subscripts and refer to one-way relaying and downlink transmission, respectively. Further, the letter is used to refer to the rate of a single user rather than a sum of users. The rate in (6) is the downlink rate of one user in one sector of the network. In the simulations of Section 7, we will focus on the sum rate over adjacent sectors, which will simply be the sum of (6) over those users. The main assumptions and parameters for the two-way model are given in Table 1. System parameters for one-way relay model. The main differences between the one-way relay model and the shared relay are the number of antennas per relay, the relay transmit power, and the number of relays per sector. Since over a large network there will be approximately 3 times as many relays for the one-way model than the shared relay model, they are given 1/3 the transmission power and 1/3 the antennas. Consider the cellular network model of Figure 3 where each cell is sectorized, and each sector has a single relay station (RS) serving a single mobile station (MS). There are an arbitrary number of cells in the network, and the base station (BS) in each cell is equipped with one antenna per sector. As in previous sections, we can assume a large number of cells to allow the analysis to focus on one arbitrary sector in one arbitrary cell. The objective then is to transmit the symbol (again dropping the time index as in previous sections) from the th BS to the th MS and the symbol from the th MS to the th BS. The relays are designed to facilitate the downlink transmission of and the uplink transmission of (where is the vector of transmitted symbols from each mobile and similarly for simultaneously over two time slots, avoiding the half-duplex loss of one-way relaying. We shall refer to this simultaneous uplink-downlink transmission as one complete transmission cycle. Base system model for two-way relaying. Each sector contains one single-antenna amplify-and-forward relay, and there is no coordination between cells. The sectors in a given cell may cooperate to decode the uplink signals from the users in the cell but do not cooperate in the downlink. In this section we consider the case where the relays are utilized as bidirectional terminals, a configuration also known as two-way relaying. Consider a single physical layer frame in IEEE 802.16j . There are four distinct parts of the frame: (1) the base station transmits in the downlink, then (2) the relay transmits in the downlink, then (3) the mobile transmits in the uplink, and then (4) the relay transmits in the uplink. In two-way relaying this transmission cycle would be cut in half. That is, parts (1) and (3) could take place simultaneously in one segment of the frame, and parts (2) and (4) could take place simultaneously in the rest of the frame. During the first time slot (phase I) all information-generating nodes in the cell (BSs and MSs) transmit their signals to the relay. In the second time slot (phase II), and after proper processing, the RSs broadcast symbols from which the network nodes, that is, BSs and MSs, may extract their intended signals. This two-phase operation is shown in Figure 4. Two-way relaying operation in a single cell. In the first phase, all transceivers transmit except the relays. In the second phase, only relays transmit, and other transceivers are able to cancel the interference they caused in the first phase. where for the reuse pattern of Figure 2, and contain only the diagonals of and . is the channel from base stations serving other cells to each relay, is the channel from mobiles in other cells, and is zero-mean additive white Gaussian noise at the relay with variance . The subscript refers to intersector interference, whereas (as in previous sections) the subscript refers to the relay, and refers to noise. Further, transmit powers have been absorbed into the channels as in previous sections. Finally, the channels and may have some zero entries depending on the frequency reuse factor of the network, but the analysis is general to any reuse factor. where subscript denotes two-way relaying, and denotes the uplink. The rate for any given user can be computed from this using the multiple access rates as given in Section 5. We use the notation instead of to refer to a single user rather than the sum over users. The main assumptions and parameters for the two-way model are identical to those for the one-way model and are given in Table 1. A shared relay is a relay that is the subordinate of multiple base stations—the base stations share the relay. As discussed in Section 3, IEEE 802.16j does not permit this architecture, but shared relaying has distinct advantages over the one-way model. The relay has antennas, where is the number of base station antennas serving each sector, and is the number of base stations sharing the relay. For simplicity in our analysis, , but the model is readily extendable to . Figure 5 shows a typical configuration for a shared relay under the general cellular model presented in Section 2. The relay is placed at the corner of three adjacent cells (hence , so that each base station has a sector pointing directly at the shared relay). Models of systems using shared relays with (a) frequency reuse factor of 6 or (b) frequency reuse factor of 1. By placing many antennas at the shared relay, interference can be canceled in both hops of communication. The shared relay behaves as a coordination of many single-antenna relays and thus alleviates the need for coordination among base stations. As will be shown in Section 7, the shared relay achieves much of the capacity gain of base station coordination without the need for expensive information-passing between distributed base stations. where is the channel from the th parent base station to the relay, is the symbol transmitted by the th base station (intended for the th user being served by the shared relay), is the matrix of channel coefficients from interfering base stations, is the vector of symbols transmitted by the interferers, and is spatially white zero-mean additive white Gaussian noise at the relay. where is the effective channel after precoding, water-filling, and dirty paper coding between the relay and the th mobile station, is the vector channel from all the interferers to the th mobile, is the transmitted vector at the interferers during the second hop, and is the additive white Gaussian noise at mobile . Here we use the subscript to denote shared relaying. The main assumptions and parameters for the shared model are given in Table 2. System parameters for shared relay model. The main differences between the shared relay model and the one-way relay are the number of antennas per relay, the relay transmit power, and the number of relays per sector. Since over a large network there will be approximately 3 times fewer relays for the shared model than the one-way relay model, shared relays are given 3 times the transmission power and 3 times the antennas. Here we have used the subscript to denote base station coordination and the notation instead of to refer to a single user rather than the sum of users. The rate in (21) is the rate of users in sectors and is thus directly comparable to (19) assuming that the services areas are the same for the two cases. For the uplink, the rates are that for the MIMO multiple access channel (MIMO MAC), whose forms are identical to those for the downlink but for the proper uplink channel substituted for and the interfering channels . The base station parameters for this model are the same as previous models, and there are no relays included in this model. System models for base station coordination with (a) frequency reuse factor of 6 or (b) frequency reuse factor of 1. Each of the systems described in the previous four sections was tested under a system-level cellular network simulation. A layer of interfering cells was wrapped around the three main cells, as shown in Figure 7. These outer cells have the same architecture as the inner cells for the respective simulations. For instance, a network implementing the shared relay will contain a relay at each vertex of each hexagonal cell, as in Figure 7. Since the sectors making up the central triangle are our area of interest, there are actually two layers of interfering relays in this case. System model under consideration for the simulations presented in this paper. The focus is on the triangular area in the center of the network. This figure also shows the frequency reuse pattern for the shared relay and base station coordination under reuse factor 6. The metric of comparison is the achievable sum rate (derived in each architecture's respective section) in the central triangle outlined in Figure 7. That is, the sum rate is the rate of the three users in the three sectors making up the central triangle in Figure 7, averaged over a number of fading and shadowing iterations. Since we have assumed arbitrary scheduling and orthogonal signaling inside each sector (corresponding to a single subchannel of the OFDM waveform), the sum rate is calculated over three users. The parameters of the simulation are given in Table 3. System parameters used for the simulations in this paper. The Type H channel model specifies a channel from a node transmitting from above the roofline to another node above the roofline. The fading is Rician with K-factor 4, the carrier frequency is 2 GHz, there is no shadowing, the relay height is 15 m, and the base station height is 30 m. For the Type E channel model, for the BS-MS and RS-MS links, the mobile is located 1 m above the ground, the street width is 12 m, the roof height is 15 m, and the distance between building centers is 60 m (based on an urban environment). The noise power is dBW, corresponding to a 10 MHz channel. Figure 8 shows the downlink sum rate for each of the architectures presented in this paper as a function of relay transmit power for reuse factors . For each case, outperforms to varying degree. Base station coordination and conventional transmission are constant across the plot because no relays are included in these system models. Downlink sum rates for each of the strategies presented in this paper as a function of the relay transmit power. The solid lines represent reuse factor 1, while the dotted lines represent reuse factor 6. Base station coordination, unsurprisingly, gives the highest downlink sum rates, a roughly 119% increase over a conventional architecture with no relaying or coordination. More striking, however, is that shared relaying achieves approximately 60% of the gains of base station coordination. When comparing the two systems, it must be emphasized that shared relaying requires no coordination between its base stations beyond that needed for synchronization in the multiple access channel of the first hop. Its main disadvantage relative to coordination is the half-duplex loss and delay associated with decode-and-forward relaying. Note that for the gains of shared relaying diminish relative to . The one-way architecture only gives a roughly 15% increase in rate relative to a conventional system, whereas two-way relaying performs worse than conventional in the regime plotted in Figure 8. Here, the multiplexing gain of the two-way relay is not apparent because we are considering only the downlink. Uplink sum rates are given in Figure 9. In this regime, conventional architectures (without power control, soft handoff, or multiuser diversity which have been abstracted out of the system) have extremely low uplink SINR, resulting in almost no rate. Two-way relaying performs similarly since the interference from nearby base stations is overwhelming the mobile device's signal unless the relay is extremely close to it (as will be discussed in the next section). The curves on this graph are flat partly because they are already in the interference-limited regime and partly because, in the case of relaying, the system is limited by the first hop, which is not a function of the relay transmit power. Uplink sum rates for each of the strategies presented in this paper as a function of the relay transmit power. The solid lines represent reuse factor 1, while the dotted lines represent reuse factor 6. 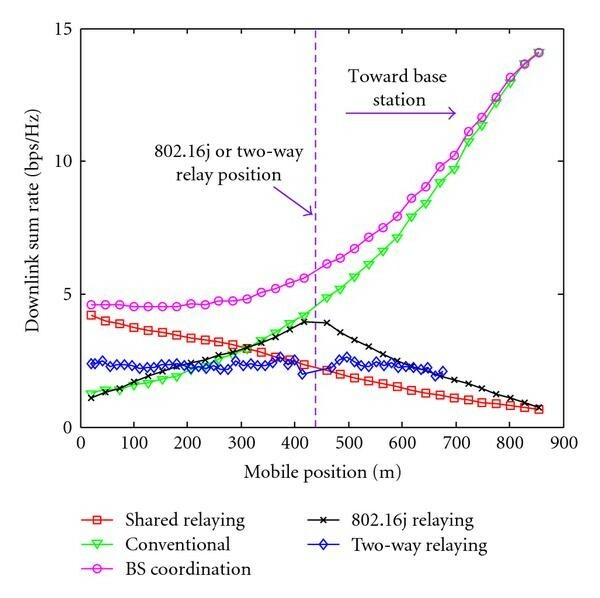 In this regime, shared relaying achieves around 90% of the achievable rate of base station coordination due to the relay's ability to remove interference and its proximity to the cell edge. The half-duplex loss is much less severe in this case. One-way relaying achieves roughly 50% of the rates of base station coordination. As in the downlink case, frequency use factor drastically outperforms across the board. 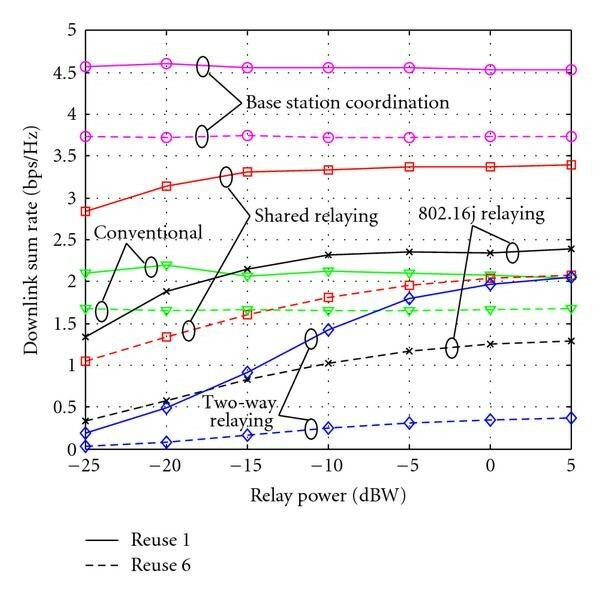 Figure 10 shows the downlink sum rate of coordination, shared relaying, and a conventional system with no relaying or coordination throughout an entire sector. The figure is for frequency reuse factor 6 because the curves are more separated in this case. At around half-way between the base station and shared relay (which is located at the left-most corner of the sector), direct transmission becomes more desirable than relaying. By adapting between these two cases based on the position of the mobile station, the downlink rate approaches that of base station coordination over the entire cell. (a) Downlink sum rate in one sector versus mobile station position for base station coordination, shared relaying, and direct transmission. A reuse factor 6 is shown because the curves are more separated in this case. By adapting between shared relaying and direct transmission depending on user location, the rates of base station coordination can be approached. (b) The geometry of the sector, explaining the x- and y-axes of part (a). The simulations of the this section give relative performance gains between different transmission strategies in a cellular network. This section describes the insight these simulations can give and summarizes the general conclusions we can draw from them beyond the relative performances. First, having a relay act as an interference-reducing station gets nearly the gains of having BS coordination over the same area. The reason this is not obvious is because of the half-duplex nature of the relay. This is made up for by the fact that the relay can be placed in an LOS position with the BS and is closer to the MS than the BS in the regime of interest. In more precise terms, the degrees of freedom lost in performing half-duplex relaying are almost made up for by practical considerations such as RS placement, all at a reduced complexity. 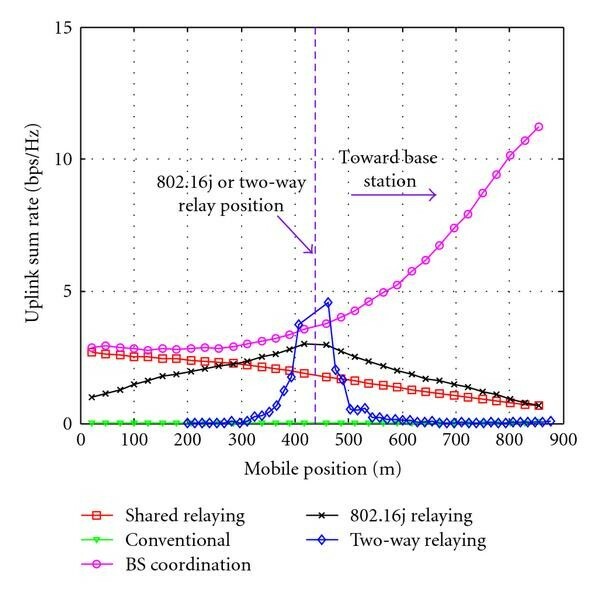 The second conclusion we can draw is that two-way relaying is severely limited in the uplink unless the relay is extremely close to the mobile and does not in general compensate for the half-duplex loss of one-way relaying in the simulated regime. We will discuss practical ways of overcoming this problem in the next section. In the previous section, shared relaying was shown to be a simpler alternative to base station coordination. Further, by spatially removing local interference, the shared relay outperforms one-way relaying by over 80% in the downlink. 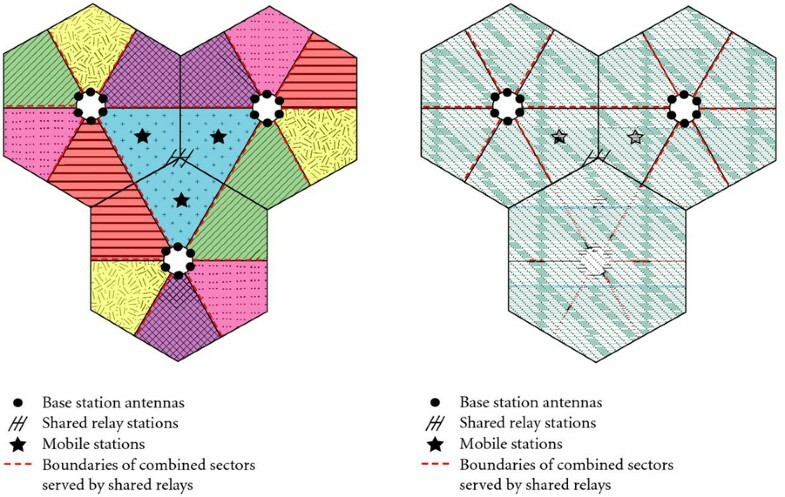 By allowing the relay to be shared among multiple base stations, the shared relay avoids the BS coordination task of associating each mobile station with multiple base stations. We now briefly discuss some practical considerations for shared relaying. We have been assuming thus far that the shared relay is moderately complex. Since it serves 3 adjacent sectors, there will be 1/3 as many relays in the network than with the one-way model (neglecting the edge of the network). Thus, an increase in unit complexity is at least partially offset by a decrease in deployment cost relative to the one-way model. The shared relay may also mitigate the need for coordinated scheduling between the sectors. If the shared relay is allowed to transmit its own control information, as in the nontransparent relay of IEEE 802.16j , it can achieve a large multiuser diversity gain across sectors without the need for the base stations to share information. It may also make handoff easier by allowing for a buffer zone where which base station a mobile is associated with is unimportant. For example, consider a mobile station moving away from a base station and toward a shared relay. As it enters the relay's zone of service, it is now served by this relay but still associated with its original base station. As it continues past the relay and into the next cell, it is still served by the shared relay, which may signal to the original base station that it is time to handoff the mobile to the adjacent BS. So long as the handoff procedure is done before the mobile leaves the shared relay's zone of service, the mobile will stay connected to the network. Recall that Figure 9 showed that uplink rates for two-way relaying were practically zero. In this scenario, since the base stations and mobile stations are transmitting simultaneously, nearby base stations are drowning out the mobile stations. This can be mitigated by only performing two-way relaying for mobiles that are very near the relay. Figure 11 shows the uplink sum rate for various transmission strategies as a function of the mobile station distance from the base station. Conversely, Figure 12 shows the downlink sum rate for the same strategies. In this case, the relay station is located 440 m from the cell edge. The mobile's power begins to overshadow the adjacent BS interference power at around 100 m from the relay, and the sum rate quickly rises. Uplink sum rate of two-way relaying and other strategies versus MS position relative to cell edge. The relay station is located 440 m from the base station. Downlink sum rate of two-way relaying and other strategies versus MS position relative to cell edge. The relay station is located 440 m from the base station. Two-way relaying aims to increase the sum uplink plus downlink rates relative to conventional relaying. However, in a mobile broadband cellular network, the uplink and downlink are inherently asymmetric, making this sum an inappropriate metric. For instance, to truly maximize the uplink plus downlink rate, one will simply allow the downlink to occur all the time. Further, allowing adjacent base stations and mobile stations to transmit simultaneously is an inherently bad idea unless the receiver is located very close to the mobile. For example, if we allow the mobile to transmit at 23 dB below the base station power, and using simple free-space path loss, the relay would have to be approximately 36 times closer to the mobile than the nearest out-of-cell base station for a 0 dB SINR. Of course, this is a simple calculation intended only to show the nature of the problem. One way of combating this is to use an antenna array at the relay to steer nulls toward the nearest base stations. This risks a mobile being in the same direction as the base station and being in the same null. Other strategies include conventional ways of avoiding interference in cellular systems such as power control and frequency reuse. We have analyzed and compared four cellular architectures for LTE-Advanced. 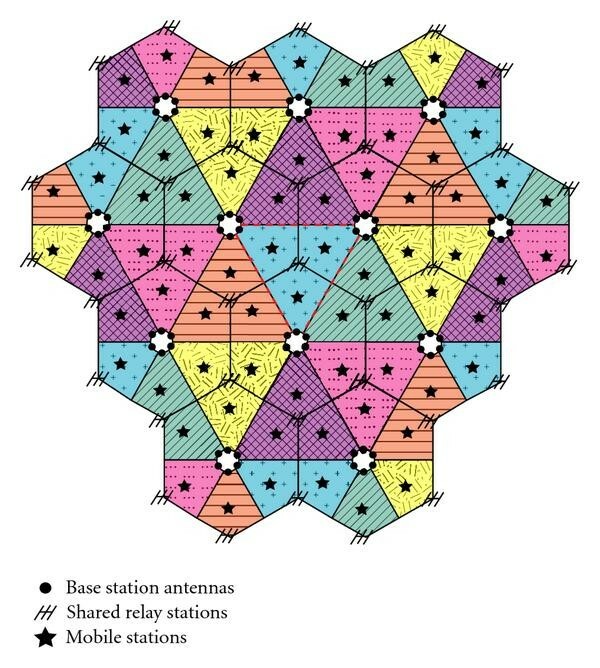 While base station coordination between adjacent sectors in neighboring cells achieved the highest rates, it is also the most complex architecture. Sharing a multiantenna relay among the same sectors is a simpler way to achieve much of the gains of local interference mitigation but still has significant complexity within the relay itself. One-way relaying, where each relay is associated with only one base station, is unlikely to give substantial throughput gains near the cell edge because it does not directly treat interference, and two-way relaying overcomes the half-duplex loss of conventional relaying provided that the relay is extremely close to the mobile. Future work will focus on more detailed design of shared relays, including scheduling, feedback, and dealing with mobility. Two-way relaying requires research for interference mitigation in the uplink. Finally, combining base station coordination and relaying is an emerging area that will be the subject of future research [46–50]. This work was supported by a gift from Huawei Technologies, Inc.